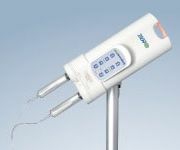 Empower MR® contrast injection system for the MR suite. It helps to improve productivity: No batteries to change or recharge throughout the day. Intuitive user interface allows for easy operation. No limits to proximity between injector head and scanner. Dual controls allow user to operate remotely or directly from injector. Compact, rotating head allows for operational flexibility. Unique rapid load and purge mode. IRiSMR® – Magnetic resonance (MR) Injector Data Management System.